Who would have thought that today the blog celebrates its one hundred blog post. Ten month ago I decided to start a blog about the literary James Bond that so often feels to be forgotten. 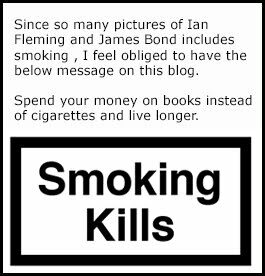 The blog was an attempt to get James Bond fans to explore the books written by Ian Fleming. You would be amazed at how many fans out there have never ever actually read the books. I myself read them a log time ago in Swedish and am now re-reading them in English for the first time. and it is a blast. During these ten months the blog has been a great success according to me with over 35 000 page views. I have received much praise but also critic for my spelling and grammar and that's fine. I have always had a difficulty in spelling and English in not my main language so please bare that in mind when reading a blog post. The blog is also on Instagram showing pictures of books with great artworks or pictures of things associated with the literary world of James Bond. The Instagram account can be found here. I myself is also on Twitter were I try to spread links to articles I read about James Bond. So if you have a link or wish to read others work about James Bond come join me here! The same goes with Pinterest where I collect pictures from the blog and also pictures of books and others that are connected to the literary world of James Bond. See the pictures here! The Blog also have a small You tube channel with more to come. You can follow it here! And last but not least the blogs Facebook page have now past over 500 followers which is amazing in my world. Make sure not to miss any post by joining the page here. 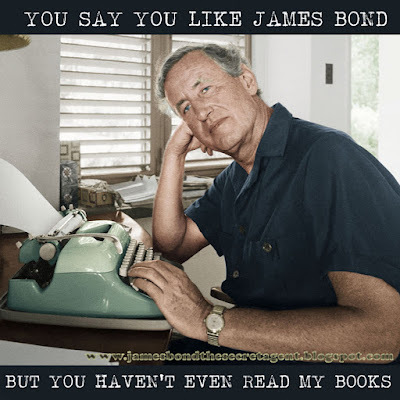 Just for the fun of it I created the below picture to mess with the fans who have yet to read an Ian Fleming novel. All fans should try him out. Please share the picture if you wish to. Thanks for your kind support to this blog. I am enjoying every minute of running it and read your comments on it.